There is always something to see and do at the Smoky Hill Museum with our great hands-on exhibits, children's area and scavenger hunts. We do, however, also have several signature programs and events. For the most current and up-to-date information, please see our event calendar. Each month on the first Thursday, the Museum joins with other cultural venues, art galleries and downtown stores to stay open late. Most months the Museum has special, free presentations on a variety of topics. Each year around January 29, celebrate Kansas's birthday at the Museum. All week long third grade classes from across the city and around the area get a taste of pioneer life through activities and demonstrations. 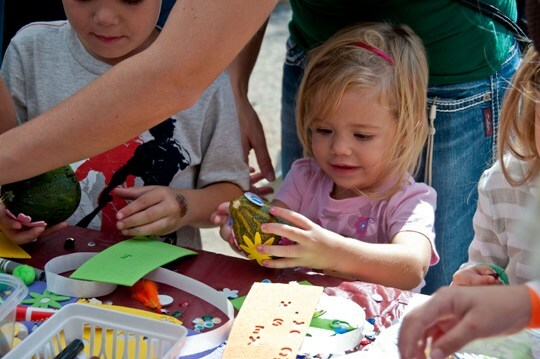 Then on the following Saturday, the whole family can enjoy making butter, shelling corn, making crafts, eating delicious birthday cake and more at the Kansas Day Open House. Stop by the Museum's installation of the Dust Bowl Days mini-golf course at the Smoky Hill River Festival and play a few rounds on the second full weekend of June. On the fourth Saturday in September, the Museum celebrates the history and heritage of the Smoky Hills region with a downtown parade, historic demonstrators, entertainment, food and special activities for kids of all ages. Admission Free.